Yay!!! I’m super excited to share my first ever post for 4c Hair Chick, an online community and platform for women with Type 4 natural hair. I’ve been wanting to step outside my comfort zone and write about hair for a while and now I’ve done it. I’m ecstatic about being part of the 4CHC team as a contributor; this is only the beginning! 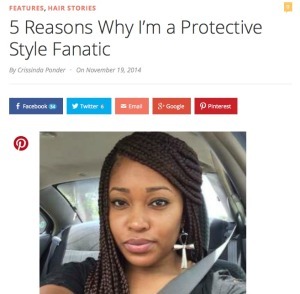 Here’s the link to my post: 5 reasons why I’m a protective style fanatic. Enjoy! Very informative post. I am also a fan of protective styles for my natural hair. Thanks for checking out the post. Protective styles are my best friend! I’ll be the first to admit that sometimes dealing with my natural hair on a day-to-day basis can be overwhelming.